Expanding on the reliable and time-tested technology of the RemoteCam2™, RemoteCam3™ and RemoteCam3X™, the RemoteCam4™ is part of Sound Control Technologies’ next generation product portfolio for digital PTZ cameras. The RemoteCam4™ camera Extension Kits offer a cost and time-saving alternative when integrating digital high definition PTZ cameras into a wide variety of presentation spaces. The RemoteCam4™ Kits provide a reliable “transparent“ link between the camera and codec/head-end. RC4-PHD – for Cisco PrecisionHD 1080p 12x, 4xS1 & 720p 7x cameras & SX80, C-Series codecs. 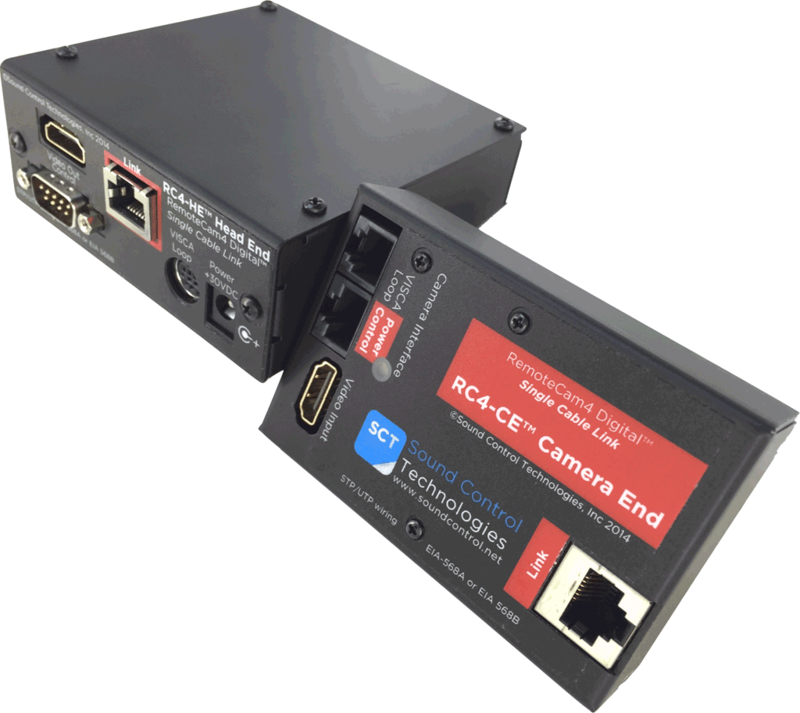 RC4-PHD-3 – for Cisco PrecisionHD 1080p 12X Camera, & SX80 or C-Series codecs when the main camera is local to the codec and secondary camera is extended. RC4-PHD-4 – for Cisco PrecisionHD 1080p 12X, 4XS1 Camera, & SX80 or C-Series codecs when the secondary camera is local to the codec and the main camera is extended. RC4-PSA – for Cisco PrecisionHD 1080p 12x camera and SX20 codec. RC4-PSB -for Cisco PrecisionHD 1080p 4xS2 (Precision 40) & 2.5x (5x) cameras and SX80, C-Series codecs. RC4-PSX – for Cisco PrecisionHD 1080p 4xS2 (Precision 40) and 2.5x (5x) cameras and SX20 codec. for the ClearOne Unite 200 camera & Collaborate Pro 600, 900 codecs. for Lifesize 10X camera and Icon 600 and 800 Codecs. for Lumens VC-A20IP, VC-G30 & VC-G50 cameras and Cisco C Series/SX80 codecs. for Starleaf GT Mini 3330, GT 3351, GTm 5250 & Sony SRG-120H or Starleaf VHD-61 camera. for Radvision EVI-HD7 camera and XT5000/7100 codecs. for EVI-HD3/DVI camera and XT1000 & XT1200 codecs. for Polycom EagleEye IV camera and RealPresense codecs. for Polycom EagleEye Director II and RealPresense codecs. for Polycom EagleEye Producer and RealPresense codecs. for Sony EVI-HD3/DVI, EVI-HD7/DVI and EVI-H100V cameras and generic head-end. for Sony EVI-HD3/DVI, EVI-HD7/DVI and EVI-H100V cameras and generic head-end when main camera is local to codec and secondary camera is extended. for Sony EVI-HD3/DVI, EVI-HD7/DVI and EVI-H100V cameras and Cisco SX80, C-Series codecs. for Sony SRG-120DH & SRG-300H cameras and generic head-end. for the Sony PCS-XG77S, PCS-XG100S Codecs & SRG-120H Camera.